I love taco salad, but it’s easy to see that if I want to keep the calorie count down I have to make a few simple swaps then I can have a large filling salad for less than 300 calories. Obviously it’s all in what you are willing to sacrifice, but one thing I am starting to realize is I am a creature of habit. I have put my taco salad together the same way each time I have made it, simply put because that’s just the way I have always done it. After leaving the items out that drive up the calorie count and making a few substitutes I realized I didn’t even miss the missing items! 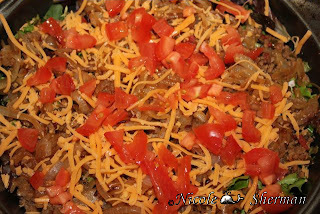 I enjoyed the taco salad without the high calorie content! I left out the tortilla chips I would normally line the bottom of my taco salad with, and substituted extra lettuce for a true salad. I don’t eat sour cream so I left that out but used fat free sour cream for my husband. I also used fat free cheese verses regular cheese! Talk about saving a ton of calories! I also doubled up on the vegetables to make the salad more filling! My taco salad would have normally been many calories now it’s calories! That’s a huge redux! The moral of the recipe redux is a total calorie savings of 219 calories! That’s equivalent to an extra meal or a great snack in calories! Take a look at the recipes you normally cook and you just might be surprised how many calories you can shave off your meal by just making a few substitutes that you won’t even notice!